Knots or Not Cartoons by Rich Diesslin. Knots Law Cartoons by Rich Diesslin. 2001 Jamboree Cartoons by Rich Diesslin. 2005 Jamboree Cartoons by Rich Diesslin. Rich has been producing Scouting related cartoons since June 1999 and several have been used at the last two Boy Scouts of America National Jamborees. Just to wet your appetite, here are just a few of our favorites. Click one of the links above to see more. 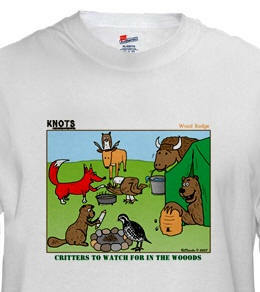 He also has all of these cartoons and more at his personal website at http://www.kampknots.com. If you like Rich's cartoons, you can own a copy on a T-shirt or just about anything - visit his store and grab a cartoon. They make great mementos and gifts. Click on the T-shirt to find out more. 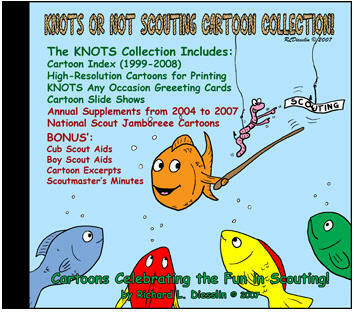 You can also buy the entire Knots or Not Scouting cartoon collection on CD to use with your newsletters, scout cards and more! Click on the CD to find out more.